I can honestly say that the my fourth day in Cebu was the best part of the whole trip. I actually woke up a bit late. I was suppose to wake up around 6AM, I think, because we'd be editing the recap video; but silly me, I woke up a bit late. Actually, it was an hour late, I think. So, I rushed to Ma'am Maris' room and went on with editing. I actually forgot the details during the morning because there's nothing very exciting about the morning activity. After having lunch, I immediately went back to Ma'am Maris' room to finish the recap. Upon finishing the recap video, I went back to my room and prepared for an afternoon with a fellow blogger, Janvic of ChimneyWolfram.blogspot.com. There were supposed to be other Cebu bloggers who I would be meeting on that day; but unfortunately, some stuff came up so it'll be me and Janvic alone. I met up with Janvic at the main lobby of the Waterfront Hotel. We chatted for awhile and then went to off to go to the Sto. Nino Basilica Church because I so want to see and have a picture at Magellan's Cross. I had so many questions about Cebu! Hahaha! Where is this, what is that, why is blah blah blah... Hahaha! Janvic patiently answered my questions. Haha! The place where Sto. Nino Basilica Church is looks pretty much like a tamer version of Quiapo. Haha! Janvic admitted that she doesn't go frequently to the place because it's really crowded and all. Forgiven! I mean, I'm also very lazy to go around Quiapo and Divisoria though I know it would be a treat for my wallet. 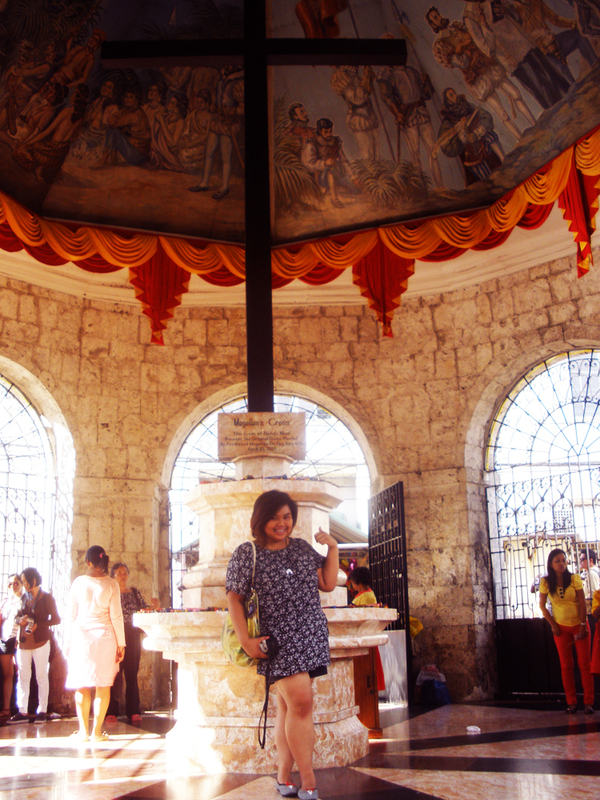 The first place we got to go to is at Magellan's Cross. We had our pictures taken there and we bought the candle sticks and the vendor sang and prayed for us. We put some of the candles at the foot of the cross while we lit up some and made a prayer/wish. I also made a wish at the basilica since it's my first time to go there. D'ya guys know that if it's the first time that you've ever been to a church, you can actually make one wish? Hahaha! I really dunno if there's any truth to that or what; but that's what my mom told me when I was a kid. Besides, there's actually nothing wrong with doing that, right? So Janvic and I went back to the hotel, bid our goodbyes. See you next time, Janvic! Had a really awesome time. Hope to meet the other Cebu bloggers when I go back there. Upon getting back to the hotel, I had to prep for the program since we'd be dancing Bayete Ingkosi again for the closing of the Summer Camp. Nothing much happened during the first part of the program in the evening and I just waited for the recap to be shown and then our Bayete Ingkosi performance. After our Bayete Ingkosi dance, there was some sort of a mini-concert by the 4HG Band (KMBI's official Christian band) and us, dancers, were invited to dance in front. It was such a fun evening and my legs danced by itself until it was all danced out! Hahaha! As I've told my fellow dancers, "Malulumpo na ako!" A fun last night indeed. Well, I wouldn't waste my last night in Cebu by sleeping early. After the program, I went back upstairs, took a bath and prepared for a night out with some of my friends at work. We had an awesome and fun night (sorry, no pictures!). Proves that my fourth day really is the best day in my whole trip. count me in on your next visit! :) it's good that you've enjoyed Cebu :) i'm a Cebuana blogger, though im not that active in posting since im too engrossed with school stuff..haha nerd, NOT! P.S. I'm hosting my first giveaway, please check it out!